Let us introduce the novelties not only in the Vizyon range, but also in the market of sliding frameless systems. 2 new modifications have appeared among balcony-type VBS systems, which are designed for terraces, balconies and interior glazing. VBS-L is a frameless sliding glazing system for terraces without a threshold. Below there is a guiding profile with dimensions of 30 mm (height) x 37 mm (width) and a double-sided wing. Profile is recessed in the floor. For comparison, the lower guide profile in classical VBS version, along with the drip profile, had dimensions of 70 mm (height) x 45 mm (width). The lower guiding profile is installed with one parking roller instead of two classic rollers, while the second one replaced by a sliding carriage. In fact, now there is no need for the lower roller to leave room. Accordingly, there is no threshold to cross at the bottom when the system is completely open. 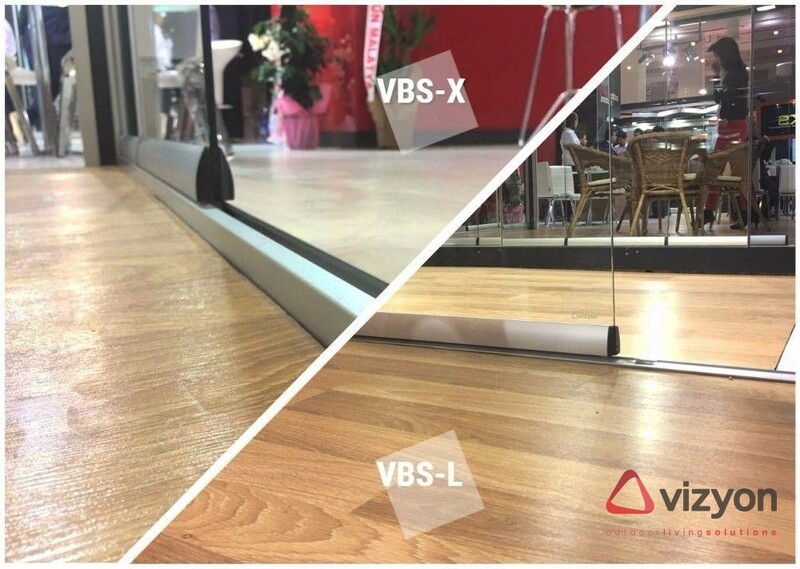 VBS-X is a frameless sliding system for terraces with low threshold. Its lower guide of 30 mm (height) x 40 mm (width) is not equipped with additional wings. It is designed for installation on terraces or on the plinth of balconies. The height of the guide ledge is 20 mm above the zero mark, which prevents accidental ingress of water and precipitation into the room. One roller is also replaced with a slide carriage, so the bottom rail is almost invisible in the open position.